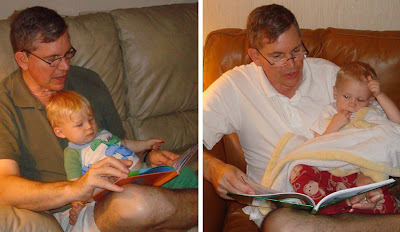 April's Little Family: A Tribute to Bedtime Stories with Grandpa. A Tribute to Bedtime Stories with Grandpa. p.s. Read a heartwarming story here, and then join Jay in the fight against cancer. It's what all the cool kids are doing. Grandpa's are the best! I love seeing my dad reading books to my boys--although they enjoy the lawnmower rides more! And you know, I never got rides on the lawnmower from him when I was a kid--it wasted too much gas! Love me some doc woods! Grandpas are the best, aren't they? Hey April! Kristen here from WTE. I need you asap...like now! haha! It is off topic, but I need the recipe on subbing canned pumpkin in a devil's food cake from you AND if you have any suggestions on how to prepare a yellow cake using substitutes will you pass that info along too? My MIL likes to poke fun at my choices to feed Gray organic foods...lol...I need a way to sneak stuff in these cupcakes so I can later tell her they were made to be healthier! Please help me. Sorry to post this here...I just figured you'd be on here vs. FB.